Description: NS Southbound Rail Train at Birmingham, Al. Description: Two versions of the versatile road switcher side by side. Could be the PL05 Hight Point-Asheboro turn. Description: The Salisbury Switcher working the Box Plant at Spencer. Description: Salisbury Switcher gets ready to blast off from Five Row with a rebuilt GP38-2 leading a GP50 and an ex-NW caboose after setting off a few cars at the box plant. Description: NS P92 has just backed its train into the yard. The idle PL25 (Salisbury Switcher) power in on the adjacent track. Description: With two of four MPUs dead in tow, the NS 88M stalled on the 1.4% grade at Fairfax Station. Two locomotives from the NS P52 at Van Dorn were sent south to couple with the lead end and pull the train of 83 stuck TopGons the rest of the way to VEPCO in Alexandria. Description: With two of four MPUs dead in tow, the NS 88M stalled on the 1.4% grade at Fairfax Station. Two locomotives from the NS P52 at Van Dorn were sent south to couple with the lead end and pull the train of 83 stuck TopGons the rest of the way to VEPCO in Alexandria. Seen here are members of both the 88M and the P52 preparing their trains to be coupled together. Description: P61 diverges from the mainline to the S-line with the usual array of nice older power in charge. Description: NS 5561 passes the then-under construction pavilion of the Southeastern Narrow Gauge & Shortline Museum, with the Virginia-Carolina 50 waiting patiently for its future home to be completed. Title: Pushing down the hill. Description: NS 5561 pushes the Local, P095 down the hill. The grade down this particular section comes out to being just over 2%. 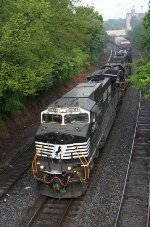 Description: NS 905, with 5561 up front, leads one of two Norfolk Southern track geometry trains past East Spartanburg, on the "W" line, the oldest continuesly operating mainline in North America. Title: Heading Down The Mountain! !